This is exciting! 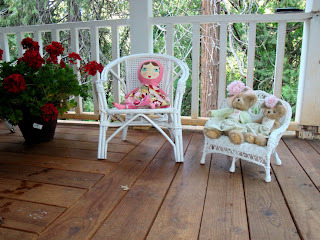 Rhondi is having a Porch Party! When I heard....well, I just had to join in the fun!! 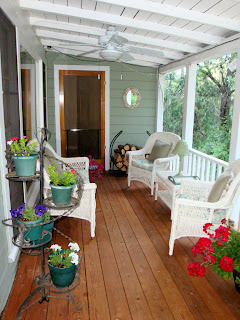 I was disappointed when I reviewed my pretty porch...because it was soooo dirty. I had to clean it up....I even washed the ceiling fan for you!! The good news is...it's clean and ready for the party!! Same camera!! I asked him why his was better. He said "lucky". I doubt that! I have lived in this house for over 21 years now. Wow. I can NOT believe that. 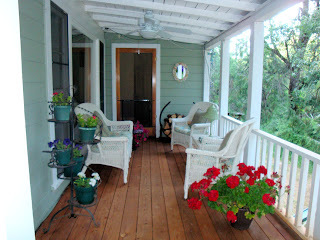 My porch has had sooo many lives. 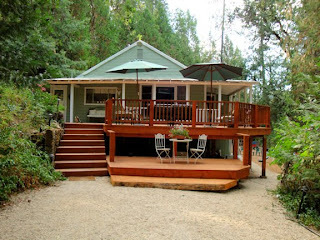 I always wanted a cute porch. After looking at the inspiration photo, I have some work to do!! I really want a snazzy rug and some great pillows too. There is so much going on in this photo. I think I need some more....stuff! Want to go shopping? 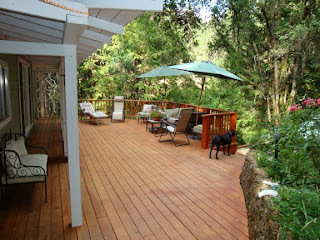 You will want to visit Rhondi for HER porch party....SHE has food!! Annabelle and the Bears wanted to come to the party. They are great conversationalists and their manners are pretty good. What do you think? Can they join us? Thanks for coming to my porch party!! Hope you had a good time! Yesterday was a really good day. Dear Daughter was home and invited me over to watch a movie. It was "The Secret Life Of Bees". She had already loaned me the book to read. It started out sad with a mean Dad, and I just didn't want to read it. While I wasn't excited about the movie, I couldn't resist a quiet afternoon at my daughter's spending time with her, so I went over to her house watch it. I actually enjoyed the movie very much. The characters were just great. DD and I got to talk about history and I had the opportunity to share stories of the past with her. 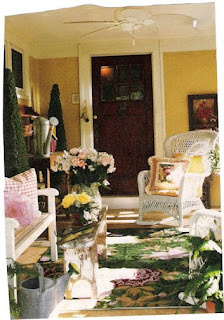 The house in the movie is a bright shade of PINK, perfect for Pink Saturday, don't you think. 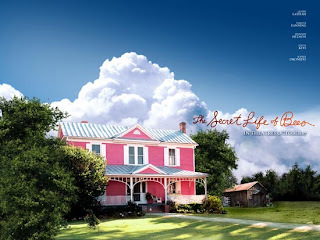 I won't tell you WHY the house is pink....get the movie and you will see. Yes, yesterday was a good day. Everynight, I think about my day and look for things to be grateful for. You just never know what the future holds. Just before I go to sleep, I thank God for another day and count up all my blessings from the day. No matter what kind of day I had, I can always find something to be thankful for. Try it....it does wonders!! Are you ready for MORE Pink??? Head on over to Beverly's and take the Pink Tour! Yep, he was getting pretty scruffy!! 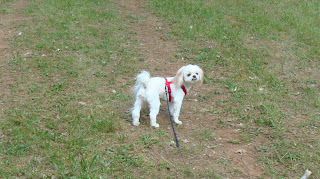 It's so funny....when I picked him up, I had to wonder for a moment if this was REALLY my doggie! He looks so cute. With his haircut, he looks little-er and younger. Wittle Pookie Wookie. Did you hear my "baby voice"? Have you ever noticed that little doggies make everyone talk with their "baby voice"? It's so hilarious if you stop and listen. It's the voice you would use to talk to a baby. All we have to do is say that word....and Pookie get's pretty darned excited. He loves his walk. This ritual happens several times each day. We don't have a fenced in area for him and even if we did, it would only protect him from running away, it would not protect him from any predators (am I paranoid?). So. we walk. Sometimes it's just me, sometimes it's just hubby. I really enjoy the time we go together. It's such a nice relaxing time to just reconnect and catch up. This picture is from our morning walk...it's my favorite one. What a wonderful way to start the day. It's crazy how loud it can be early in the morning...the birds are putting out quite a racket!! 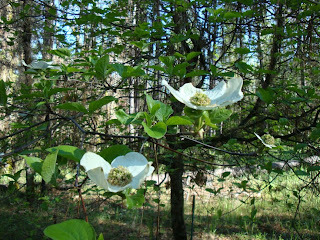 The dogwoods are in bloom in the mountains. We only have a couple of them here. When we were in Yosemite a while back, they were in bloom EVERYWHERE! I just love the changing seasons. 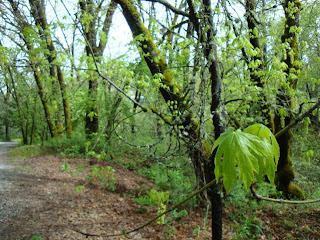 The spring green is just incredible. So pretty! 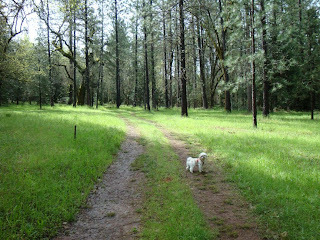 When I walk Pookie, I just go down our road and come back. When I am with hubby, we go out to the place we call "the 10 acres"....how imaginative he he!! It's family property and there is nothing built on it. Kind of like a wild park. Pookie just loves it. It's not far, right next to our place. My Mother-in-Law just called me. She had some guys come out and do some mowing out there the last couple of days. Yesterday, they heard something nearby. The fellow always has a shotgun with him, so he grabbed it and went to investigate. Right there, in the grass, just sitting there.....observing them....was a Mountain Lion. Yep. You heard that right. A Mountain Lion in my OWN backyard (so to speak). 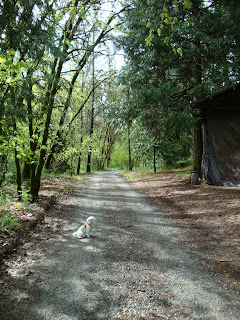 Many times, I have thought about walking out there by myself, and then I think...no...I'll wait until hubby is with me. My Dear Daughter walks out there every day (when she isn't traveling). She walks out there for exercise ...all by herself. Not good. Wait until I tell her about this!! What happened next? Nothing really. He said the mountain lion just ran away. Now my paranoia is re-categorized as healthy caution. Don't you think? It's a beautiful day. The sun is out, I can hear the birds and my pretty little fountain outside the window. It's the perfect day to celebrate all things PINK! Thanks to Beverly! I have a collection of scarves. I used to wear them all the time at my J-O-B. I have been racking my brain to remember how long it's been since I left my corporate job....two years? or three? Feels like five!! Do I miss it? Do I miss having a "Boss"? Quotas? Crazy policies that are constantly changing? Stress? Do I miss all that time devoted to a company that didn't care about me at all? Are you kidding? NO! I don't miss it at all!! 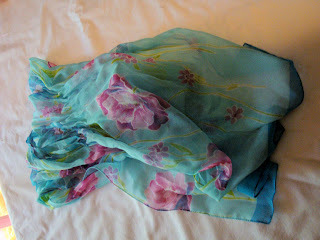 And, I haven't worn these scarves (and other "work" related clothes) since then!! This is one of my favorites...very bright! This one is so sheer that the camera had trouble focusing on it. I love butterflies. This one looks great on my straw hat. It was a gift from my dear daughter. It's my favorite color....she knew that! This one is a small square, one of my favorite shapes. It looks good around the neck or tied on to my purse. I couldn't even find my MOST favorite one of all. It will bother me all day wondering what I did with it!!! Now that I work for myself from home, I wear the most COMFY clothes!! I highly recommend being your own boss!! I only dress normal when I leave the house. I can be on the phone for my business, and I will most often be found in my sweats. I have a HUGE collection of those!! My favorite is GAP, I get them from the outlet. I have so many black sweat outfits that you might think I wore the same clothes every day. I'm wearing one right now!!! Maybe I should put on a scarf?? If you have a hankering for more pink....head on over to Beverly's and take the Pink Tour! I just sent an email and at the end I wished the recipient "Happy Memorial Day". That got me thinking about how little I know about this "Holiday". I was wrong. It's not a "Happy" day at all. It was originally intended to be a day of remembrance. A somber occasion. I am truly, personally...grateful to those who serve our country in the military. They give so much to protect all of us. And, some have made the ultimate sacrifice. 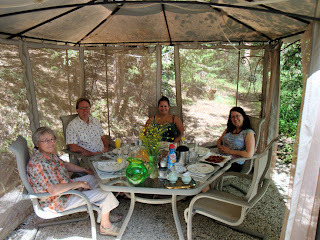 Yes, I am having a Barbeque, with my family. We will gather together and have a wonderful time. We will talk about whatever we wish and eat whatever we wish....relishing in our freedom and living out the promise of this country that so many have fought to protect. Thank you to all who are serving, have served or have a loved one who is or was in the United States Military. Yes...it's Sunday....and YES I forgot Pink Saturday....for the 2nd week in row. What's up with that??? 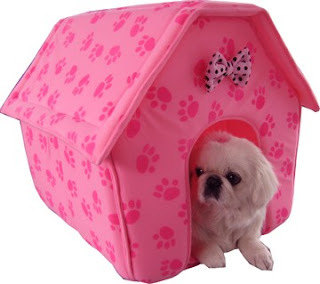 I am putting my self in the PINK DOG HOUSE!! Actually, this little doggy house is adorable....and that doggy reminds me of our own Pookie Bear. Pookie is a boy...do you think he would mind a Pink dog house?? I have had a busy couple of weeks and I am in withdrawal....blogging withdrawal that is!! I am missing my favorite blogs and wondering how everyone is doing. Can't wait to catch up!! I sure hope you are all having a WONDERFUL weekend. And, don't worry....it's not too late to see the rest of the Pink Saturday Gang...head on over to Beverly's and check it out! This is my kind of "ambiance"!! I could eat in the tent for EVERY meal!! A great big Happy Mother's Day to all the Moms out there!! I had my pink Saturday post all planned. You know what they say about the best laid plans, right? I completely forgot to post my pink. darn. Right now, I am attempting to post from my phone while I am here in Yosemite with hubby. All day we have been on the lookout for pink, and I found something interesting to share. How do I get it here to my blog...from my phone? Have you tried this? 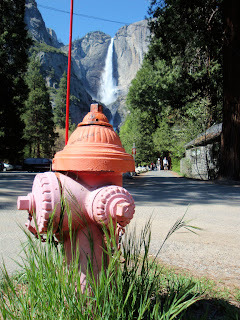 just in case my photo does not appear through the miracles of modern technology, I will tell you that it is of a fire hydrant that once was red, now faded to a lovely shade of pink, with Yosemite Falls in the background. Here goes. Wish me luck! I'm lovin the sun today!! Keep it coming!! What a wonderful morning. As I was waking up, I was counting my blessings. 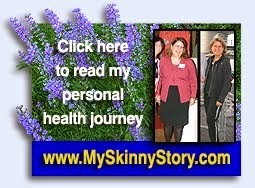 If you have ever clicked on my button “My Skinny Story”, you would learn that I am an associate with Isagenix. This was the blessing that was on my mind this morning. First of all, I am blessed to have a mentoring call that I attend every morning right here from home. This morning’s call inspired me in so many ways. Not just for my business, but for my personal life as well. Just a few thoughts that I took away were: I attracted everything that is in my life right now. Walls and obstacles are not there to stop us, but to strengthen us. Fall in love with what you are doing and fear will go away. There was sooo much more, and I am left with MUCH to ponder. I am so grateful to have found a way to earn my living from home, on my own time and in my own way. And, in addition, I get to be around people who help me to grow in a personal way. I never want to stop that. It’s like food for the soul. Here is another blessing that came to mind, also an Isagenix blessing. Yesterday, I thought it was going to be warm (wishful thinking). 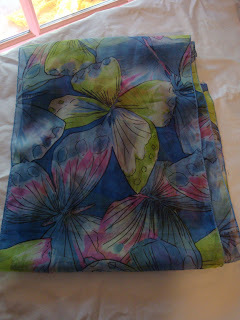 So, I rummaged through my summer clothes (that I still haven’t brought out! 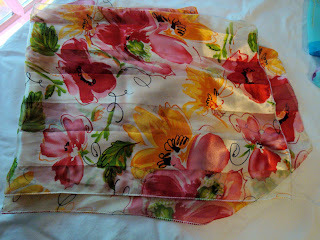 ), and I pulled out a favorite pair of capris. I slipped them on and felt so happy and delighted. You see, in my adult life, I was always changing sizes (usually just getting bigger). I used to joke that my clothes would “shrink” when I put them away for the season. Ha Ha. Well, they don’t shrink anymore. I have been on the Isagenix Nutritional Cleansing food (usually my breakfast) for 5 years now and I have stayed the same size all that time. Each time I feel my weight begin to creep back up on the scale, I simply follow a “cleansing schedule” and just like magic, I’m right back to the good size. Another Isagenix blessing is the health benefits. I can’t even remember the last time I was sick. I just love that. And, I get to watch as the people I coach get their results. It’s the funnest part of my job. I love to hear the excitement and amazement in their voices. I’m hooked on that. This Isablessing is a BIG one. We are getting ready to go on our Annual family vacation. We missed it last year because of the wedding, so our family really needs this to reconnect and catch up. We go to Yosemite for about a week. I was feeling concerned about money and paying for our cabins. Then I remembered that I have a good deal of money built up on my Isagenix card. They pay us on a Visa card each week. Yippee. I will use that. How’s that for a blessing? Today I am grateful to Isagenix, for my freedom, for my health and for my personal growth (and for my vacation!!). What a true blessing. Hello fellow Pinkies!! It's Pink Saturday again. Let the search for all things PINK begin! This comforter set is special to me. 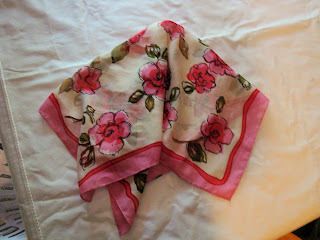 It once belonged to my dear friend, Connie. She likes to call us "Country Mouse and City Mouse". We live far from each other and visit as often as possible. 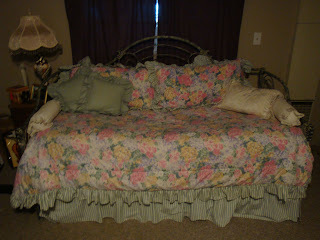 For many years, this comforter set was on the day bed that I slept on at her house. When she redecorated, she gave it to me. Now when she visits me, she sleeps on this comfy bed. Whenever I look at it, it reminds me of a wonderful friendship. Ready for some more PINK? Take the PINK tour. Visit Beverly's and find out all about it! !